It’s an awareness-raising project which focuses on sheltered workplaces (workplaces that employ people with a distance to the labour market, whether it be a disability or social vulnerability). The project itself is at a point where I have reached out to interview 30+ initiators and directors of social initiatives and sheltered workplaces to understand what is going on in their local work environment, what goes well, what are the obstacles that need to be overcome and what is the plan for the future to achieve a fully inclusive labour market. Through these interviews, I also want to uncover the drive of these people to maintain these social initiatives and be able to communicate this to others. Since 2015, the ‘participation law’ has been in effect here in the Netherlands, which removed government subsidies that previously helped these initiatives. A lot of funding for these organisations has since then disappeared and on a local level, all the legislation is very dispersed now as it is no longer centralised by the Dutch government. What my project does is storytelling and raising awareness for these people that work in social workplaces. Tell us more about yourself and how this journey began. I’m 30 years old, I live in Almere. 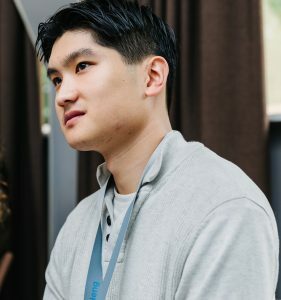 A Singapore-born Dutch national, I grew up in the Netherlands from a young age and have a study background in International Business Administration. In my last year of studies, I went to India through AIESEC for a development traineeship. It was my first exposure to extreme inequalities and poverty; I had the opportunity to work with orphans who had been affected by HIV and on environmental awareness projects. It was profoundly impacting to see this extreme poverty with my own eyes, and ever since then I’ve supported social initiatives Asia and Europe. You always have to ask who is vulnerable in third-world countries – but I was also considering who the vulnerable are here in a first-world country like the Netherlands? After researching this question with the NGO I was then working for, I had the opportunity to start my own organisation which was the birth of Well-Being Networks. The idea came from my own experiences and research – the initial plan was to get an organisation up and running with funding – but I quickly realised that the focus should be on raising awareness and not necessarily running an organisation. 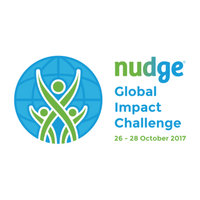 I heard about the Nudge Global Impact Challenge and signed up for a wild card. Since then, I now continue to work on my project outside of my day-to-day work life in social impact investing at Oikocredit International. The common line in my story is how I went from a traditional profit-making business world to following my heart for the social sector and in the career choices I’ve made since then I always aim to combine my business skills with social mission. Did the Challenge change or affect your initial impact plan? How? The Challenge is a wonderful way to meet like-minded and ambitious young professionals, peers basically, who are doing wonderful things in their fields and organisations. You build a network in 3 days that would otherwise take years to build. That’s the strength of the programme. In terms of crafting the plan, I learnt it’s being able to adapt when necessary and that the final outcome is never the same as what you planned initially. I focus on systemic change and that’s very difficult to achieve in 8 months. Awareness is very hard to measure. There is definitely impact, but it’s not about the number of views of the videos I make, it’s about the right kind of views – by policymakers and HR professions, for example. Just looking at the 30+ initiatives I’ve worked with until now – I see there are many people involved who are doing valuable work by providing meaningful jobs, but they are just simply not made visible. What do you need now to make Well-Being Networks a greater success? What’s the future of Well-Being Networks? Now I’ve collected a body of video interview content (which ranges from ordinary citizens to members of parliament) and I would like to document it, maybe in a written book form. Obviously, there are still a lot of stories to uncover and I will continue to do so. Financially I’m not dependent on this project. A major victory would be more awareness for this inclusive labour market and achieving some legislative change for social enterprises who aim to help those with a distance to the labour market. Then of course, the idea of an inclusive labour market is not limited to the Dutch context only. We’re really proud of Bryant and all he continues to achieve, we hope the discussion he is creating on inclusivity in the labour market continues to grow throughout society!